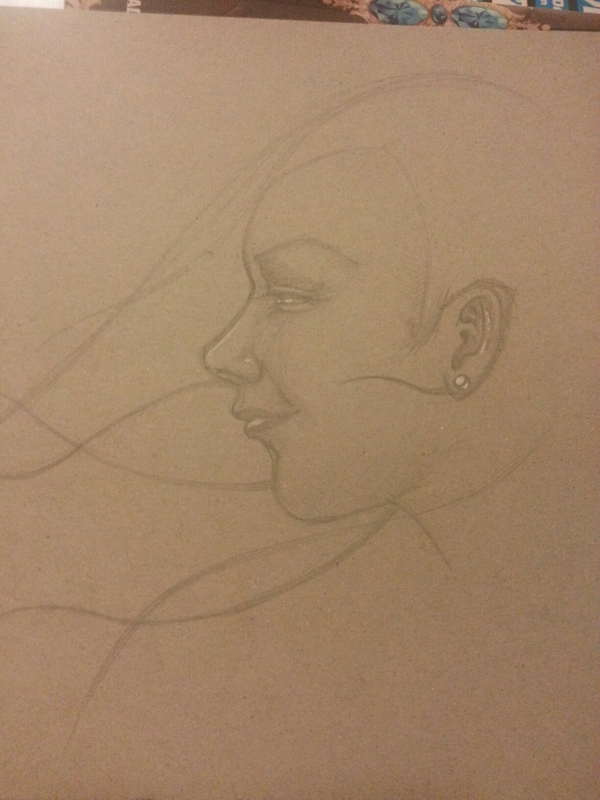 I needed to draw something last night, and this ended up on the back of some cardboard packaging. It’s a nice midtone, and a hell of a lot cheaper than buying grey or brown paper. I was cutting up food boxes that I had collected, so I could use them for die cutting and things. 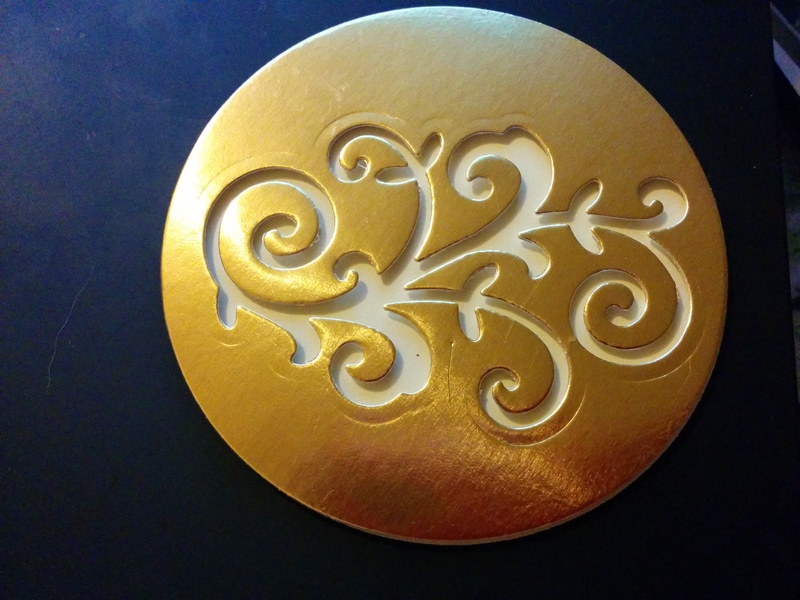 Layering three to five pieces of card die cuts together make a rather sturdy piece, which can be used as pendants and embellishments. When using packaging, you can layer so the plain side is outwards, then paint and seal the piece. You can use nail polish to paint it, put a coat glossy accents, make a layer of paper using the same die, punch a hole in each layer before gluing them together (make sure they line up) or even bend the piece while the glue is wet and make it keep a curved shape. Luckily, I have plenty of cardboard boxes, to craft with, that I’ve been hoarding, but slowly getting through. My craft room is coming along slowly. I’ve got both bookshelves up now, but that involved moving a whole lot out of the way, which is taking up a lot of room in the middle somewhere. My cat thinks it’s a fun game to climb out of reach (knocking down boxes as she does,) and meow for pats all the time. The other cat like standing behind me when I’m moving boxes. The problem mainly with the room is I’ve spent a few years throwing things into boxes, without properly sorting or organising. That’s the problem with inspections every three months. By the time you get to the stage of it looking worse before it looks better, you need to rush to put things out of sight, not minding which box its in. So today I finally wound all my embroidery thread onto the cardboard holders (not sure why they aren’t sold on them) and began untangling the mess of my ribbon boxes. I know I’ll find more of these while sorting through, but if I leave it, I’ll run out of time again. I need to do this right. It will be more functional, and I will find things I never knew I had or have been looking for. It will be like going to the craft store without spending money! I played around with my bigshot today. 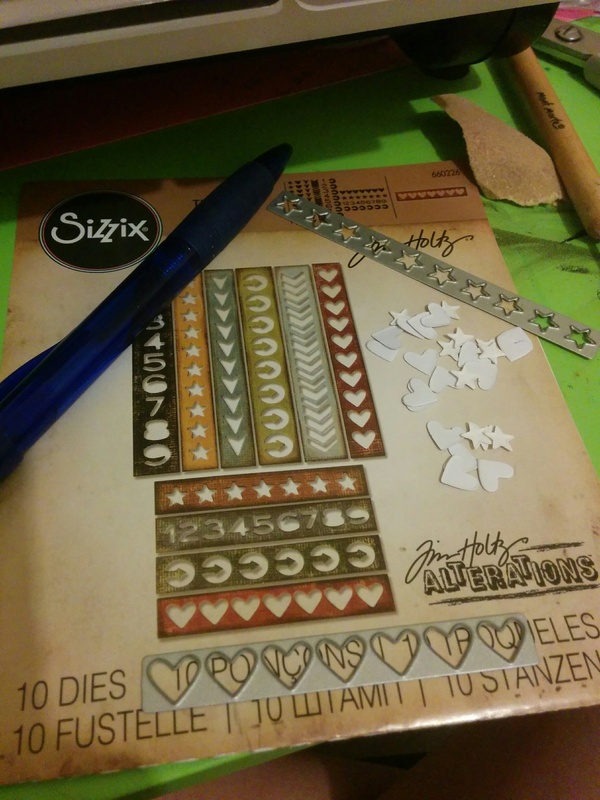 Trying to make something out of my limited collection of dies. 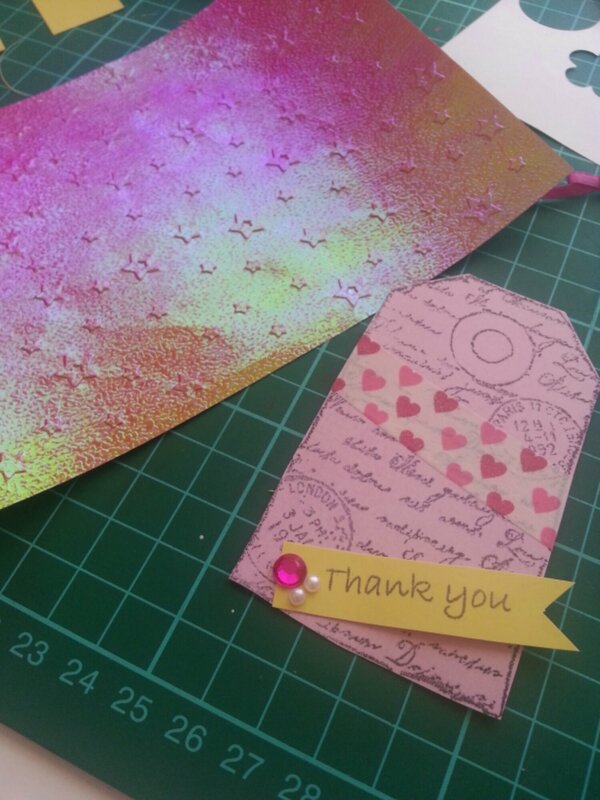 On the left, I dry embossed some two colour iridescent paper (I used the red/green because I’m not a fan of it) it worked pretty well, as the stars shine red when the rest is green. I threw bits together and stamped some tags. I didn’t do a whole lot, but played. 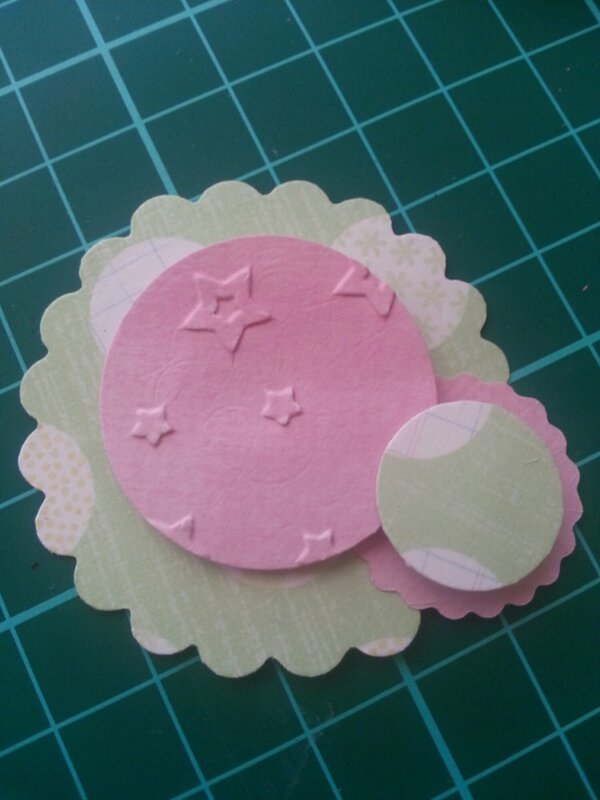 I’d like to make paper embellishments for future cards and some scrapbooking. 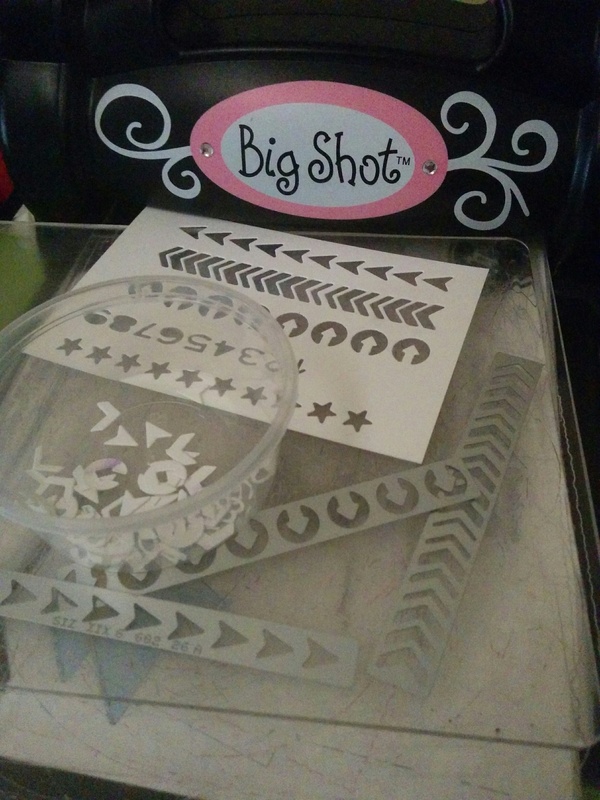 I wanted to make some tags, and forgot I had the tag shaped stamp, so I stamped and cut it out by hand. I’ll probably embellish them when I need to use them, and have someone in mind. Also trying to figure out the dies I can get the most use out of, so I can do more without buying hundreds that I’ll only use once. 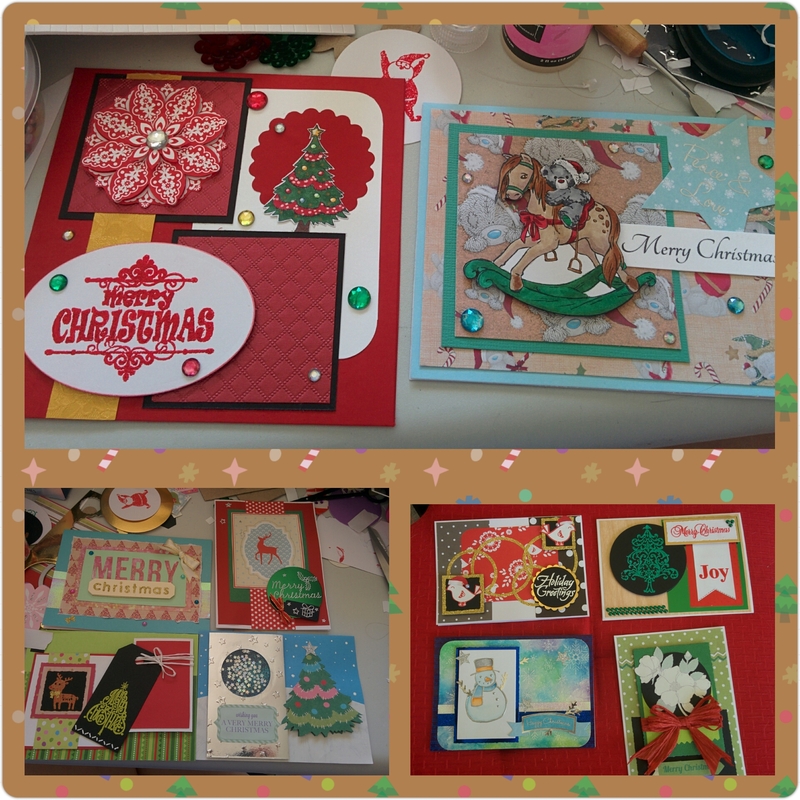 I had some vintage diecuts around and have been wondering how to use them. 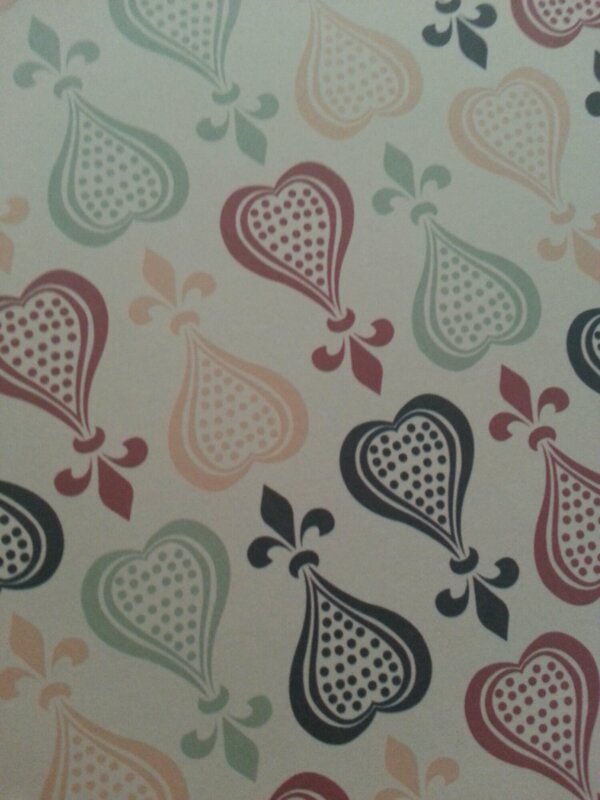 After seing the lovely background paper, I thought it matched well. 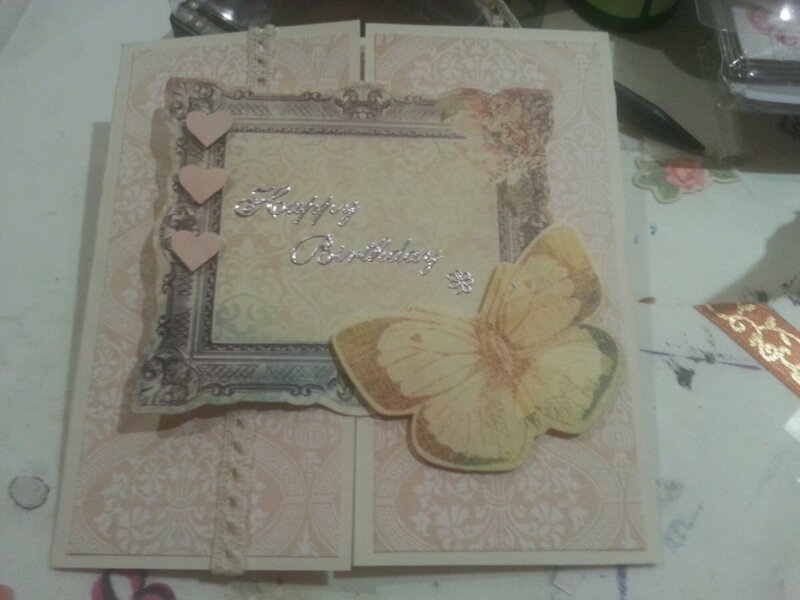 When I’m making cards, I usually begin with a colour scheme or theme to begin. Ideas for colours are everywhere. If you have difficulty, then look at patterned papers, and match the colours. Even bed displays in catalogues I find good, as there is usually a large pattern with complimentary colours involved. 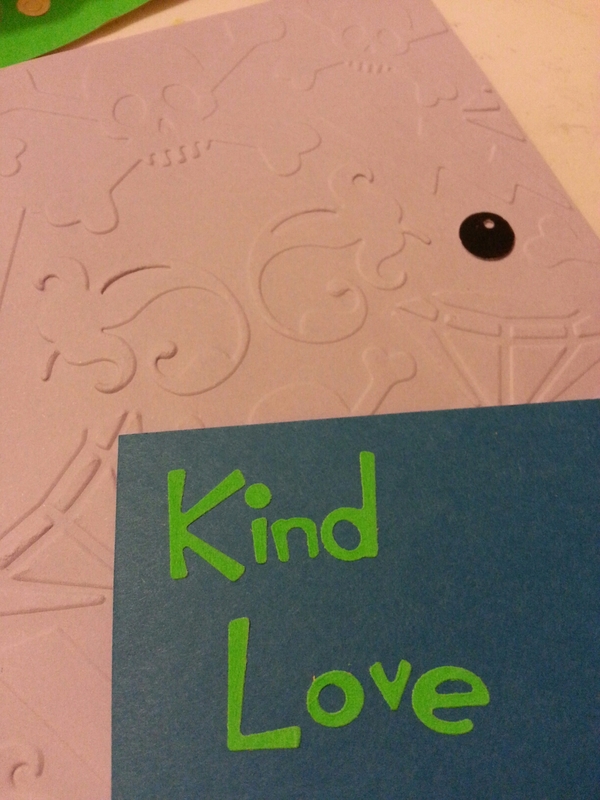 Today, I also die cut these hearts from card, and glued 3 together for a strong thick shape. 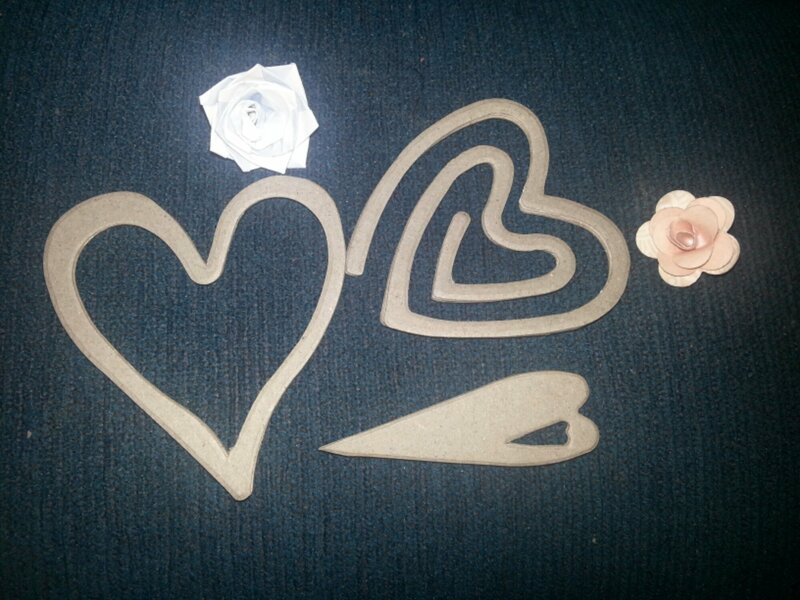 With these shapes, I can paint them and attach to necklaces. 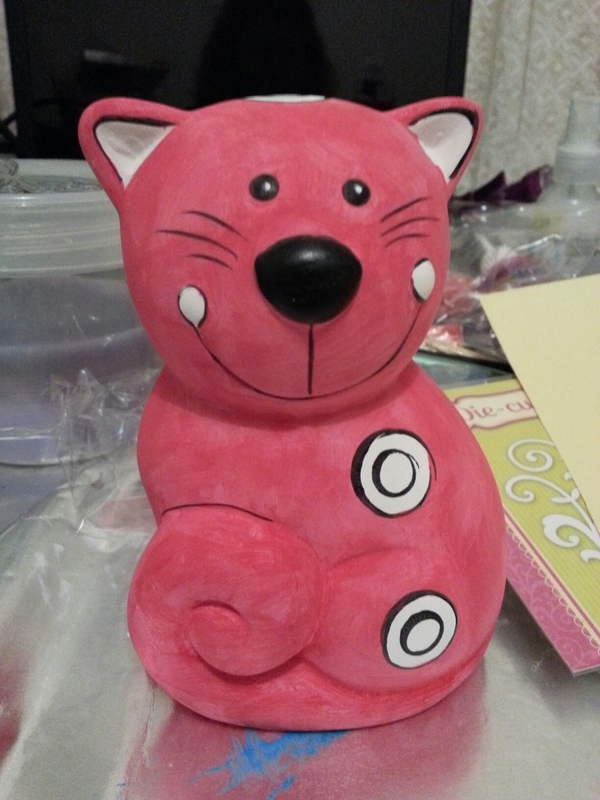 I would normally paint it with nail polish, as it gives a nice shine and strength, but until my asthma settles down, I’ll have to stick to paint.